Each place value chart in this section is has different numbers of place values, including two versions of the place value chart with wholes only and two versions of the place value chart with decimals. Periods are the groupings of three place values, so for example the "thousands" group or the "millions group" typically separated by commas. 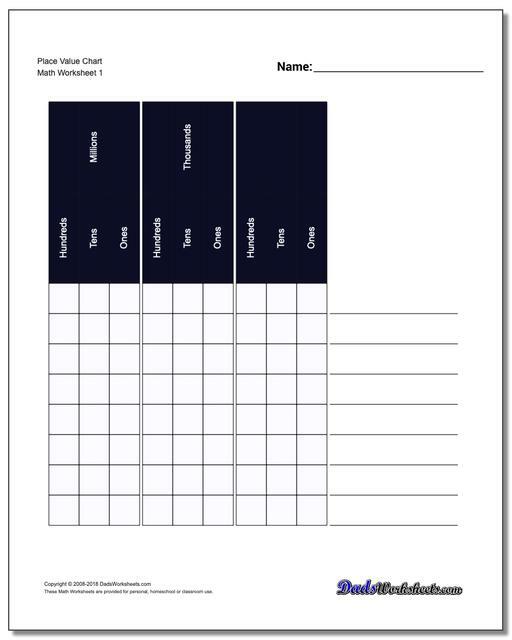 Each place value chart in this set is divided into periods, including two versions of the place value chart with wholes and two versions of the place value chart with decimals. 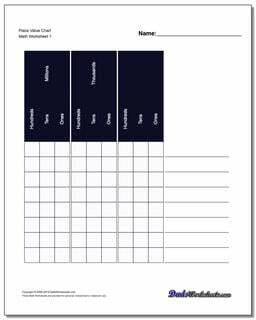 Memorizing the multiplication table is one of the most important math skills we can teach our kids. Without times table mastery, more advanced math topics are infinitely more challenging. As we're learning multiplication facts, having a complete multiplication table around can be a bridge to success in all areas of mathematics. Print these out and have them on hand! 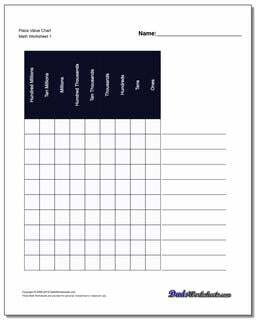 In addition to these multiplication table printables, you can find Multiplication Worksheets here, including Multiplication Table Grids where students fill in the missing multiplication products.